World-famous conductor and Mariinsky Theater director Valery Gergiev, co-chairman of the organizing committee of the 15th International Tchaikovsky Competition, shares his expectations for this year’s event and talks about the new format as the contest opens in Moscow and St. Petersburg. Rossiyskaya Gazeta: This year, for the first time in its history, the Tchaikovsky Competition begins not with the first round but with the auditions. Whatisthepurposeofthischange? 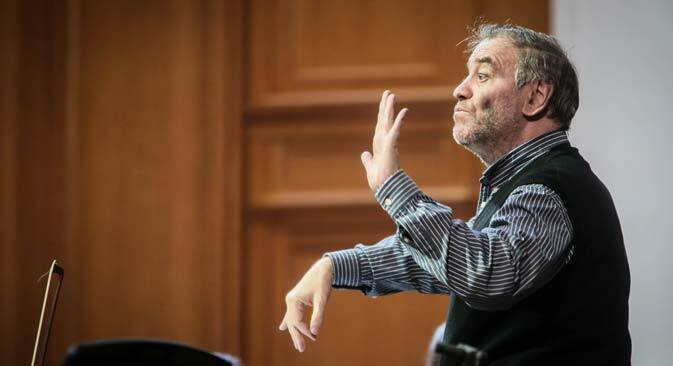 Valery Gergiev: We have decided to make auditions part of the competition because it is only in a live performance that a musician can reveal themselves. Judging by the selection in the Piano category, it is already clear that the bar at this competition has been set very high. The contestants in that category turned out to be so strong that 36 of them, instead of the planned 30, will be taking part in the first round. R.G. : The main achievement of the previous competition was the performance tours arranged for its winners. That was the first time that the competition set itself a specific goal, to find concert musicians. Whathavebeentheoutcomes? V.G. : Practically all the finalists of the previous competition performed together with me not only in St. Petersburg and Moscow, in Russia, but also abroad. We are planning to do the same after this competition too. Needless to say, the winner of the Grand Prix will have more opportunities than the other winners. But it does not mean that there will be no interest in them. The International Tchaikovsky Competition is held once every four years. The first, in 1958, included two disciplines – piano and violin. American pianist Van Cliburn achieved worldwide recognition when he won the competition at the age of 23 at the height of the Cold War. The winner of this year’s Grand Prix will be announced on July 3 in St. Petersburg. Performances by all contestants will be broadcast online. R.G. : How would you assess the experience of performing with the winner of the Grand Prix of the previous competition, Daniil Trifonov, whom you have taken on a tour of the world’s best concert halls? V.G. : Trifonov has received practically everything that the competition can give to its winner. But the main thing is that he has come into his own not only as a winner of the Grand Prix but also as a musician who instantly became of interest to audiences all over the world. His very first performances generated an excited reaction, which further prompted the desire to work with him not only in me but in orchestras too. So he has performed together with the Mariinsky orchestra and the London and the Vienna Philharmonic orchestras. It is a truly global story that, thank God, turned out magnificently. R.G. : The previous competition marked a serious technological breakthrough in the form of high-quality internet broadcasts, which received a lot of positive feedback internationally. This time round, online broadcasts will be carried out by the French TV channel Medici. How was this choice made? V.G. : The previous experience was in many respects wonderful. However, Medici are professionals who have long established themselves in Europe and now in America too. Six months ago, they were filming Mariinsky orchestra performances at Carnegie Hall. The Mariinsky Threater has its own system of online broadcasting. Our experts have been working with Medici for a long time and are now working with the organizing committee of the Tchaikovsky Competition. From June 15 to July 3, 120 applicants can be seen online, playing the piano, the violin, the cello and singing in front of a world-renowned jury. The whole competition will be available online live and then for four years after the event on tch15.medici.tv. R.G. : What do you expect from the upcoming competition? A new artist with the Grand Prix? V.G. : I very much hope that the competition will introduce us, both musically and personally, to a new generation of talent. And I hope that we shall discover them not for an hour but for years to come. For me personally this is a very special emotion because back in 1988 I, then a young conductor myself, introduced the very young Zhenya Kisin and Vadim Repin to the London public. It was nearly 30 years ago but I can still remember that feeling of a miracle taking place. That is why I find it necessary, interesting and exciting to discover new talent.